Phoenix – CBRE has completed the sale of Gateway Four, a 137,069-square-foot, single-tenant office building, located at 444 N. 44th Street in Phoenix. The property is fully leased to State Farm Insurance and commanded a sale price of more than $22.9 million. 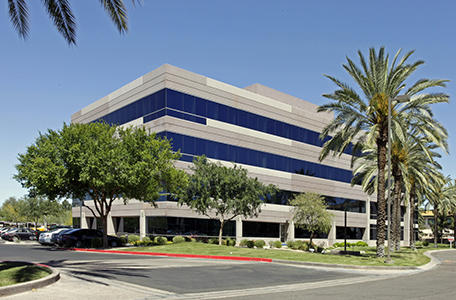 Tom Adelson and Jim Fijan with CBRE’s Phoenix office negotiated the sale. The buyer was Kansas City, Missouri-based VanTrust Real Estate, LLC. The seller was LBA Realty of Irvine, California. Built in 1998, Four Gateway is currently home to a portion of State Farm Insurance’s local operations. However, State Farm is set to vacate the property in late 2016 when the company consolidates local operations at its new regional headquarters in the currently-under-construction Marina Heights located at Tempe Town Lake. Four Gateway is part of the larger Phoenix Gateway Corporate Center. The office complex is comprised of three other class A office buildings: One Gateway, Two Gateway, and Three Gateway. The development is situated near the northwest corner of 44th and Van Buren Streets and is comprised of more than 569,661-square-feet of class A office space.